Kennon A. Keith’s New Book “The Bullying of Natalie Cordova” is a Breathtaking, Emotional Thriller that Delves into the Mayhem, Fear and Redemption of Abuse. Recent release “The Bullying of Natalie Cordova” from Page Publishing author Kennon A. Keith is both captivating and cultural; this work keeps the reader mesmerized by the illegal and wrong actions of the main characters. Kennon A. Keith, a Christian, family-man, devoted writer and author, has completed his newest work “The Bullying of Natalie Cordova”: a gripping and potent journey of intrigue, mystery and manipulation with several unexpected moments. Published by New York City-based Page Publishing, Kennon A. Keith’s chilling work will leave the reader on the edge of their seat! Natalie Cordova is a victim. Bullied and belittled by classmates and family alike, she is an outcast. Her life has been a nightmare from kindergarten through her senior year of high school. Having no friends to call her own, nor able to seek comfort in her family, she accepts her place in life; to live and die alone. Dreams mean nothing to her…until she has one; and within that one dream, she finds her strength. She will no longer merely deal with her fear, she will use it. As fear turns to anger, anger gives way to rage, and rage burns into hate; her way forward is clear. In order to end her suffering, she must end those who caused it. “This is the end. The end of my pain, the end of my torment, and the end of my past. A past I did not want, but had forced upon me. Your hatred, abuse, and treatment of me, led me to this. And while I will burn in hell for this, it was well worth it.” – Natalie Cordova. 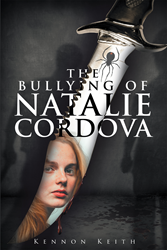 Readers who wish to experience this profound work can purchase “The Bullying of Natalie Cordova” at bookstores everywhere, or online at the Apple iTunes store, Amazon, Google Play or Barnes and Noble.